International retail music franchise, originally based in Sacramento, California (USA). From 1960 until 2006, Tower operated retail stores in the United States, which closed when Tower Records filed for bankruptcy and liquidation. Tower.com was purchased by a separate entity and was not affected by the retail store closings. The corporate name was MTS Inc., but this was little-known compared to the much more widely recognized Tower Records. In 1960, Russell Solomon opened the first Tower Records store on Watt Avenue, in Sacramento, California. He named it for his father's drugstore, which shared a building and name with the Tower Theater, where Solomon first started selling records. Seven years after its founding, Tower Records expanded to San Francisco, opening a store in what was originally a grocery store at Bay Street and Columbus Avenue. In 1979, Tower Records in Japan started its business as the Japan Branch of MTS Incorporated. The following year, Sapporo Store, the first in Japan opened. The chain eventually expanded internationally to include stores in Japan, United Kingdom, Canada, Hong Kong, Taiwan, Singapore, South Korea, Thailand, Malaysia, the Philippines, Ireland, Israel, United Arab Emirates, Mexico, Colombia, Ecuador, and Argentina. The Tower Records stores in Japan split off from the main chain and are now independent. Arguably the most famous Tower Records outlet was the purpose built building that company staff general-contracted, with many personally contributing their labor, which opened in 1971 on the north west corner of Sunset Boulevard and Horn Avenue in West Hollywood. In New York City, Tower Records operated a suite of stores on and near lower Broadway in the East Village. The main store, located at the southeast corner of East 4th Street and Broadway, consisted of four levels, sold mainstream items, and was famous in the 1980s for selling albums of European new wave bands not yet popular in the U.S. It was a noted hangout for teenagers from the wider metropolitan area. The Tower Records Annex was in the same building, but located "in the back" at the southwest corner of East 4th and Lafayette Street, and stocked items which were older and somewhat more obscure (as the CD replaced the LP, vinyl moved from the main store to the Annex). The third store, Tower Video, was located on the southeast corner of East 4th and Lafayette Street, and specialized in video and, for a while, the second floor of this location also sold books. Their location on the Upper West Side, near Lincoln Center on 66th Street and Broadway, was a magnet for those working in the field of musical theatre. 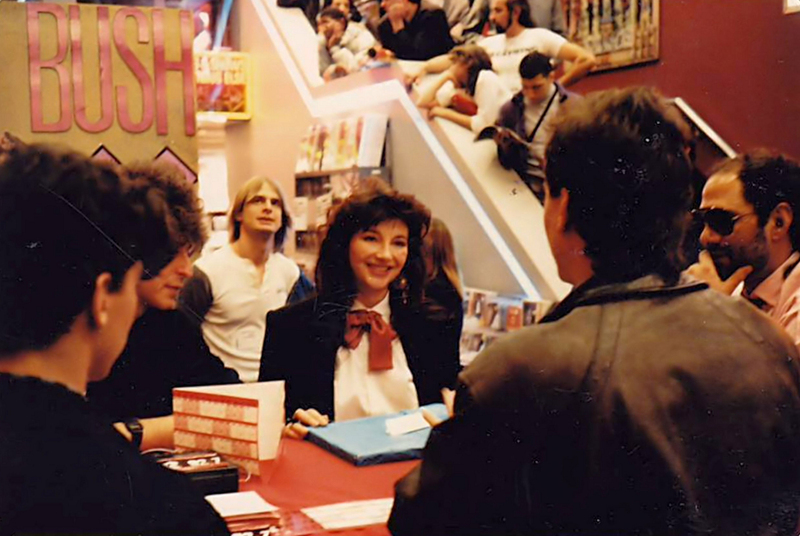 Kate Bush appeared in the Tower Records store in New York twice, to sign records for fans. On November 17, 1985 she appeared in the shop before recording appearances in the programmes Live At Five and Nightflight. On 9 December 1993 she was scheduled to appear between 4pm and 6pm, but due to a long line of fans waiting outside the store, she eventually stayed until 7.15pm. Tower Records entered Chapter 11 bankruptcy for the first time in 2004. Factors cited were the heavy debt incurred during its aggressive expansion in the 1990s, growing competition from mass discounters and Internet piracy. Mismanagement, managerial incompetence, and crippling restrictions from the first bankruptcy deal also contributed to Tower's demise. In February 2004, the debt was estimated to be between $80 million and $100 million, and assets totaled just over $100 million. On August 20, 2006, Tower Records filed Chapter 11 bankruptcy for the second time, in order to facilitate a purchase of the company prior to the holiday shopping season. On October 6, 2006, Great American Group won an auction of the company's assets and commenced liquidation proceedings the following day. This included going-out-of-business sales at all U.S. Tower Records locations, the last of which closed on December 22, 2006. The Tower Records website was sold separately. Kate Bush at Tower Records, New York. Gaffa.org, retrieved 7 November 2018.